DPIRD’s Dr Steve Davies has reviewed a decade of water repellent soils research and identified several farm management options that will be profiled at the annual Grains Research Update in Perth, WA. 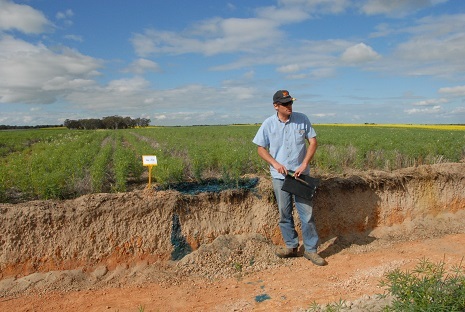 THE lessons learned from a decade of water repellent soils research in Western Australia will give growers new ways to manage the constraint, including short-term mitigation strategies and longer-term amelioration options. Water repellent soils comprise about 9.9 million hectares of the State’s agricultural region, costing grain growers an estimated $250 million per annum in lost production. The WA Department of Primary Industries and Regional Development (DPIRD) has reviewed data from its field experiments and trials and work by the CSIRO from 2009-18. The project, undertaken with co-investment by the GRDC, identified several suitable options to manage soil water repellence. Department soil scientist Steve Davies said the outcomes of the analysis would give grain growers greater confidence when making investment decisions to overcome soil water repellence and other soil constraints to improve crop productivity and profitability. “Mitigation strategies, like paired-row sowing, near-row sowing and wetting agents, provide a relatively inexpensive, short term solution that assists early emergence – although the yield response is typically smaller and more variable,” he said. “It is important to note the use of banded wetting agents are currently best suited to dry seeding cereals on forest gravels in the south west, responses from break-crops are smaller and responses on sands are far less reliable. “Amelioration using deep tillage, like spading or inversion ploughing, may be more expensive but provide more long term benefits across most repellent soils and locations. Dr Davies said while the benefits of soil inversion were clear, success required careful paddock selection and management. “The practice should be avoided on soils where there is a risk of bringing too much clay or toxic soil to the surface,” he said. The review highlighted that strategies to overcome water repellent soils were heavily influenced by soil type, climate and associated agronomic considerations. “This analysis provides a better understanding of crop responses to different management practises depending on their soil type, location, crop type and other interacting factors,” Dr Davies said. With increasing interest in dry seeding, Dr Davies warned water repellence will often be more strongly expressed and more challenging in some cases. “Like all soil constraints, water repellent soils need to be managed as part of the whole farming system,” he said. The latest strategies for overcoming water repellent soils constraint will be profiled at the upcoming 2019 Grains Research and Development Corporation (GRDC) Grains Research Update in Perth on Monday 25 and Tuesday 26 February. Regional Updates are also scheduled for Albany and Geraldton.